As we decided the outward route Ian chipped in and seemed shocked, alarmed and disgusted we were to ride such a long way. He was under the impression the last Sunday in the month was an easy ride. Duncan laughed and immediately put him straight explaining we were heading to Elton. The look of dejection and hope/spirit draining from his eyes seemed to fire up the rest of us as we clipped in and set off. After riding towards Macclesfield and making a slightly wrong turn, we slowly freewheeled through the town centre market avoiding pedestrians. I overheard Justin behind me looking at the market stalls and saying “Hmmmmtreacle”. Still not 100% sure if there was treacle for sale or just someone catching his eye? Even on the go slow pedestrian pave of the town centre market I could just about see Darren darting off up front… a la Cancellara. Darren’s fast pace continued up the first few big hills with the rest trying to follow. Duncan mentioned to Justin and Ian something about keeping his ‘powder dry’, but his water bottle appeared well mixed so we just continued to follow. As Darren was chatting to Dunc about Level 2 training and the fact that “Eatin is Cheatin” I enquired as to Justin’s footwear. Whereas my fingers tend to feel the cold it appears Justin’s weak spot is his hobbit-like feet. It takes thick socks, a plastic bag and 2 pairs of overshoes to just about combat the cold. I started to think at this point that I could have done with extra layers on certain parts of my body, but as yet development by big brands is slow in the ‘todger’ warming department! As we climbed Upper Elkstone we decided to stop for nature and a photo. As you can see clearly it was icy, snowy and foggy. Geoff is sporting the latest in gay headwear, a purple buff. Darren is executing his usual ‘Byker Grove’ grin, Justin is giving it the blue steel look with Ian lurking in the background. More hard climbs followed and Darren’s early enthusiasm surprisingly seemed to subside. Justin and Duncan now began to set the pace. As we descended into Elton via a small muddy road, cars and tractors seemed hell bent on slowing Duncan’s stupid pace. The Café stop had long since gone and was converted into a B&B much to the disappointment of everyone. We continued a further 5 miles where Youlgreave would surely provide much needed calories. On hearing the café stop was a matter of miles away Geoff set the pace up a 2 mile climb. He did not realise everyone was off his wheel as all he was concentrating on was warmth and food! 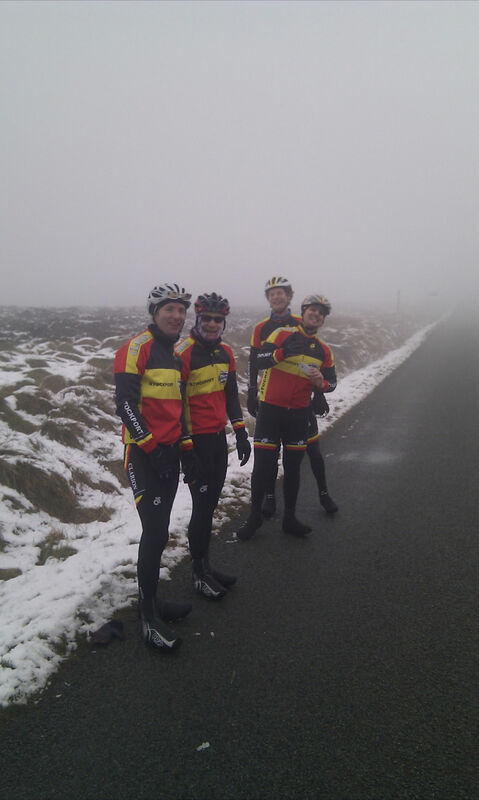 After some nice grub and almost enough mayonnaise to go round we hit the cold for a hard slog home. Again more of the same followed, hard steep hills followed by rolling roads. Duncan was up for an even trickier route home but Darren was not feeling it. We all agreed with his comments. After we passed Hollinsclough it was a long rolling road towards Buxton. Geoff and Dunc took it in turns as the rest seemed more than happy to follow the draft fest. After Buxton it was Long Hill where Justin and Darren started to get excited about the prospects of home. Duncan commented that Justin could have done a few turns earlier as he drafted a car and ascended at warp speed! As we descended back down and hit the A6 for home everyone was starting to feel the ride. We clocked almost 5 hours in the saddle, 77 miles and 4,535 feet of climbing. Special mention must go to Will who was nowhere to be seen, Ric who heard the words Elton and was nowhere to be seen and Tony who relaxed with several Peroni the night before and was nowhere to be seen.